"Scientist", Stephen Hughes has “specialist” knowledge in chiropractic care of children. It is an absolute disgrace that he has been admonished by the General Chiropractic Council. 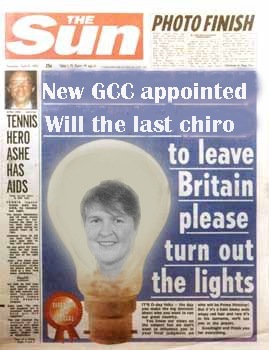 When I ran for a place on the General Chiropractic Council I was nominated by 5 chiropractors who had been the subject of vexatious complaints which had been thrown out by the GCC. I warned it could be you. While a member of council I warned BCA president Tony Metcalfe of the problems within the GCC. Not only was Tony not interested, “honourable” man that he is he forwarded my e-mail to GCC chair Peter Dixon and I was removed for a breach of confidentiality. The fact the confidentiality was reporting the misdeeds of GCC officers was irrelevant. As we know seven hundred chiropractors are having complaints processed by the GCC. The cases are being held behind closed doors because the GCC did not have the money for 700 public hearings. The associations left them off the hook, accepted that the GCC would have to throw the skeptics a few bones, the survival of the GCC was paramount VAT is 20%. Nevertheless the GCC has had to re-mortgaged its offices. The CHRE is also worried because the government has withdrawn its funding, leaving them to get their funding from the other health care regulatory bodies. The GCC has laid out a plan to the CHRE to recoup the £2,000,000 cost of Zenos complaints by hiking up registration fees. When the GCC could not take action on many of Zenos complaints, Coats and her staff (as is the norm) went through the evidence looking for other things they could charge the chiropractors with. On finding “evidence”, she contacted Zeno asking him if he would like to include other chiropractors at the practice in the complaint. “I note the reference by David Tredinnick to complaints against chiropractors” She went on to state “This is not a matter we have ever discussed with Mr Tredinnick and the GCC has not categorised any complaints it has received as spurious”. Here you had two skeptics having fun “moron baiting”, implying that all chiropractors were making outlandish claim about their abilities and ripping off patients with claims of cures. To make matters worse their allegations were been aided by the very people that two years previously were responsible for promoting the profession, the GCC. Every day chiropractic skeptics present anecdotes of the very worst of chiropractic as a representation of the entire profession. It is as if I presented GP Harold Shipman as a reason for not seeing a medical doctor. “What was originally a dispute between the BCA and one science writer over free speech has become a brutally effective campaign to reform an entire industry.A staggering one in four chiropractors in Britain are now under investigation for allegedly making misleading claims in advertisements, according to figures from the General Chiropractic Council. Campaigners collectively worked their way through the BCA’s membership list, Googling each member, and cross-referencing any claims on their website against previous rulings by the advertising watchdog”. To skeptics all this was a great laugh, to them we are merly “uneducated cult of quacks” terrified of our own shadow not worthy of any respect.Despite Margaret Coats best efforts the majority of complaints are being thrown out, but hidden away in the first batch are some of the bones the GCC have to throw at the Skeptics. Ten chiropractors have been found guilty of Unprofessional Conduct (UPC) and admonished, there are more to come. I went to college with the first two two be admonished 9&10 who work in the same clinic, Claire Gordon and Stephen Hughes. Claire did the minutes for me when Tony Metcalfe as ECU president came down to AECC in 1994 to reassure students that registration would be a good thing for the profession and my concerns were unfounded.The decision was made on January 21st and although skeptics like Edzard Ernst have announced the verdicts they have not commented, when I asked exactly what these chiropractors are they guilty of and which patients did the harm. Stephen Hughes is a particularly interesting case. He graduated from AECC in 1990 the year I arrived. One thing that was apparent in the early 90s was the poor quality of paediatric training chiropractic students got. On graduating Stephen went and got the appropriate post graduate training in paediatric chiropractor care and with a Tone Tellefsen started putting on excellent courses for the rest of us to learn from. They were the pioneers and without a doubt contributed to the improvement of the paediatric course to the level Joyce Miller has developed it to at AECC. Mr Hughes submitted that the statement was purely a reference to postgraduate chiropractic training in paediatric care. He denied that the statement highlighted claimed that he was a specialist in Paediatric Chiropractic. The GCC submitted that the wording “trained as Paediatric Chiropractors” amounted to a statement by the Respondent to being a specialist in a field of chiropractic. The Committee determined that the website statement “trained as Paediatric Chiropractors” raised the inference that there was a specialist sub-set of chiropractors with a paediatric specialism. This was particularly so in view of the words “trained as”. The Committee noted the terms in the Code of Practice at C1.9 which states that chiropractors “… must not make claims to being a specialist or an expert in a field of chiropractic…”. The Committee accepted the GCC’s submission that the statement amounted to a claim to being a specialist in Paediatric Chiropractic The Committee therefore found Particular 8 proved. The Committee went on to consider whether the facts found proved in this case amount to Unacceptable Professional Conduct. In reaching this decision, the Committee took into account the advice of its Legal Assessor, together with submissions made by the Respondent and those made on behalf of the GCC. The Committee again referred to the relevant sections of the Code of Practice at C1.6. and C1.9. The Committee considered whether the Allegation of Unacceptable Professional Conduct was well founded by reason of its findings in relation to the Particulars found proved. The Committee decided that Particulars 1 and 2 could not amount to Unacceptable Professional Conduct as they are merely factual Particulars. In relation to Particulars 6 and 8 which the Committee has also found proved, the Committee was satisfied that they amounted to Unacceptable Professional Conduct, which is conduct which falls short of the standard required of a registered chiropractor. In reaching this decision the Committee found that there had been breaches of both C1.6 and C1.9 of the Code of Conduct. The Committee was concerned also that there had been an unjustifiable level of pressure applied to members of the public which exploited their lack of experience or knowledge about either health or chiropractic matters contrary to C1.6.Furthermore it is contrary to C1.9 for a chiropractor to assert that they are a specialist or expert in any particular field of chiropractic. The Committee was mindful that its role is to protect patients and the wider public, to maintain public confidence in the profession and to declare and uphold proper standards of conduct. In determining the appropriate sanction, the Committee has taken into account the General Chiropractic Council’s Indicative Sanctions Guidance. It has been mindful that any sanction should be proportionate and sufficient to protect patients and the public interest. The Committee noted that the Respondent is of previous good history and took account of the mitigation provided by the Respondent. The Committee was satisfied that the Respondent has shown some insight into his failings. It accepted that the Respondent did not intend to mislead or abuse the trust of members of the public. Also, there was no evidence that there has been any direct or indirect patient harm by reason of the content of the website. In particular, the Committee noted the Respondent’s submission that he has taken steps to reconstruct the website and ensure that it complies with ASA Guidance. For all these reasons, the Committee was satisfied that an Admonishment is sufficient and appropriate in this case, and is the minimum necessary to maintain confidence in the profession.The Respondent should be in no doubt that any finding of Unacceptable Professional Conduct is a serious matter and should not be taken lightly. The Committee would expect that the Respondent would ensure that the reconstruction of the website reflects the criticisms made by this Committee, and is in accordance with the Advertising Guidance published by the GCC in March 2010, and in future maintained in compliance with relevant applicable legislation. The Committee determined to admonish the Respondent. The Respondent must ensure that in the future when publicising his practice or permitting another person to do so, any advertising materials including websites are in accordance with the Advertising Guidance published by the GCC in March 2010, and maintained in compliance with relevant applicable legislation and guidance. 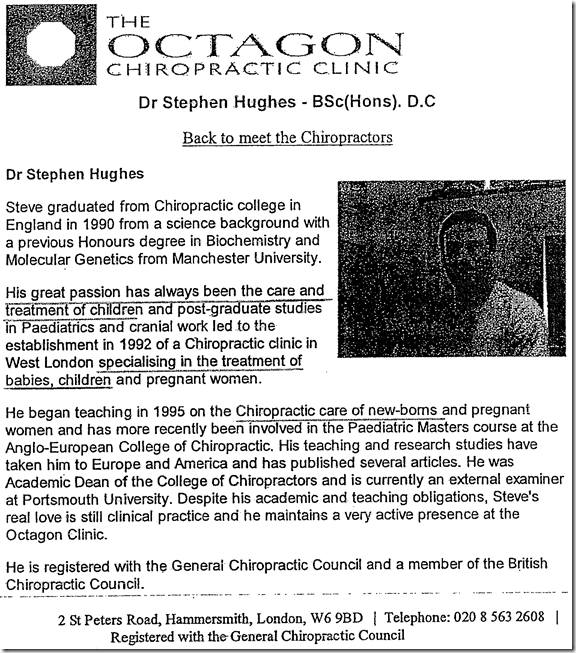 Reading Stephen Hughes CV below I will leave it for colleagues of Stephen Hughes, rather than the clowns on the PCC or the skeptics to judge whether Stephen Hughes has “Specialist” knowledge in chiropractic care for children and whether he is entitled to call himself an expert in this area. He may not thank me for saying this, praise from me can end careers in chiropractic but I believe him to be a role model for UK chiropractors and the profession must stand by all chiropractors sacrificed to the skeptic cause; Moron Baiting”. Chiropractors were also happy to go down that route. McTims did not want BCA people saying they were better chiropractors and the BCA people drawing up the Act who considered themselves the “elite”, did not want chiropractors graduating with MSc degrees in the 90s claiming they were better. The wording of the chiropractic act was drawn up by civil servants, it was not a matter of cost. The problem was/is how the act was interpreted by the GCC and their lawyers. Osteopaths got a legal interpretation which stated the could weed out vexatious cases, this is why they have far less cases going to PCC than chiropractors (at least when I was on council). Margaret Coats insisted on getting her own QC to give his interpretation whic was “case to answer” http://www.chiropracticlive.com/unfortunately-peter-dixon-and-the-general-chiropractic-council-are-3-years-and-700-complaints-too-late/ so any minor infringment of the COP and SOP was sent to PCC and 700 (I hear now the number is closer to 800 were stuffed. The problem is the way the GCC rules are written. They copied the osteopaths rules (cheapskates) to get it thru parliament. You cant have a specialism in osteopathy was purely to stop cranial osteopaths using the osteopathy title, when they didnt do “proper osteopathy” (my dad was a cranial osteopath and is also a physio so I remeber how pissed off he was at all the politics). Unfortunately chiropractic specialists, chiropractic paeditrician etc fall foul of this rule. What the grown up thing to do would be would be set a standard to which these titles can be used. How many Chiropractors use CCSP “certified chiropractic sports phycisian” you have to be one to work at the Olympics but if you use the title you earned you are breaking the rules. Fancy testing it? Fred Bloggs BSc DC CWASITSIFWIHDSATBICUTTFFOBPBMR. It is a stupid rule and needs to be looked at in the context of what standard makes a chiropractic specialist, but as it stands sadly there is no defense as there is set standard by which anyone can be a specialist. I wonder if a paediatrician who retrained as a chiropractor could even be a Chiropractic Paediatric Specialist, (I suspect in that case the rules would be bent for the greater political good.). They are not commenting on them, at all. The impression out there is chiropractors were claiming cures for cancer. When its all over and the complaints are off the websites the skeptics will say the GCC covered it up, held the hearings in private and let off really bad people. In my opinion every single admonishment should go for Judicial Review to the High Court thats how you show these complaints were vexatious and the chiropractic profession has not been trying to mislead or rip off the public. Its all a total over reaction you can see what the GCC are trying to do, but its like watching a child do up buttons with boxing gloves on. I still cant understand how, if you have done post graduate training you arent a chiropractor who is a specialist in paediatrics. Even if the RCT’s show Chiropractic treatment is completely ineffective for “colic”, we are trained to diagnose, and this aspect appears to be totally ignored by the GCC. I dont know if they accept specialist training equals better diagnosis. After all we are required to make an accurate diagnosis and present the patient with their treatment options. What about Mills manouvre in children recognised medical / chiropractic reduction of dislocated radial head. Do RCT’s show we cant do this, but physios can, or perhaps there is evidence to show its not safe when done by a chiropractor? Chiropractors absolutely should be able to be paediatric specialists, or any other type they choose to be if they do the required training. I have (need to be careful here) a “special interest” in prescribing foot orthoses and I have done additional training, which I would consider makes me a specialist in that field. Personally if my profession allowed it I would love to learn ultrasound guided steroid injection and high colume saline injection for tendon injuries. Interestingly the Cranial Osteopaths had the same problem when registration of Osteopaths occured, they all became Craniopaths, Craniosacral therapists etc, or risked prosecution. By the way Richard Tone from the article was in my year calling her a pioneer is making me feel very old, pack it in!! And I wonder if Martin Robins “The Lay Scientist” from the Guardian will publish that 93% (so far) had no case to answer and than rather than being a profession on the ropes we are a pretty honest and ethical bunch acting in the best interests of patients. If there are no Experts in Chiropractic what about the chiropractors that the GCC get to testify as expert chiropractic witness Richard Brown is a 1990 AECC graduate. He has been in continuous private practice since this time and owns three clinics, one of which is a large multidisciplinary centre. He has acted as an expert witness in many professional misconduct hearings and in 2009 was awarded a Master of Laws (LL.M) degree from Cardiff University. He is the current President of the British Chiropractic Association. If there are no Experts in Chiropractic what about the chiropractors that the GCC get to testify as expert chiropractic witnesses;Richard Brown is a 1990 AECC graduate. He has been in continuous private practice since this time and owns three clinics, one of which is a large multidisciplinary centre. He has acted as an expert witness in many professional misconduct hearings and in 2009 was awarded a Master of Laws (LL.M) degree from Cardiff University. He is the current President of the British Chiropractic Association. Was just helping someone with their response to the GCC and I would advise all respondents to be careful Margaret Coats is still fishing for stuff to hang you with. They ask vague questions about what you do hoping to tie it to things that would be breach the code of practice. Anything in your response try and link it to stuff on the GCC or BCA website rather than the template. For example The PCC concluded that Stephen Hughes was guilty; The Committee noted the terms in the Code of Practice at C1.9 which states that chiropractors “… “must not make claims to being a specialist or an expert in a field of chiropractic…”. Would it have been OK to say “I have a special interest in providing chiropractic care to children” I have got postgraduate courses in paediatrics and we dont treat adults at this clinic. On the GCC website in FAQs they dont seem too bothered as long as you are on the register. My reading of this FAQ is; If you are looking for a specialist in the chiropractic care of children, you’ll find it helpful to check first by telephoning your local chiropractor. GCC FAQ Q9. What qualification should I look for? Chiropractic is a world-wide profession and there is a great variety in the titles of qualifications. 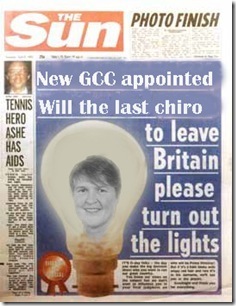 The important thing is that all chiropractors in the UK must be registered with the GCC. Some chiropractors have a special interest in (for example) sports injuries or the care of children – if this is what you’re looking for, then you’ll find it helpful to check first by telephoning your local chiropractors. What will it take to get chiropractors to react to the actions of the GCC? I am dismayed that this post does not get a torrent of comments calling for a more direct and effective strategy to call the GCC to account. Has anyone heard from the associations lately? It is irresponsible for representative bodies, elected by and accountable to their members, to operate without consultation and communication. Is the hope that no news is good news? Are chiropractors still hoping that they can sit back and do nothing while other people save their profession? How many sacrificial lambs will be enough? Richard will be proven correct again when an increase in registration fees is the catalyst for everyone to pull their heads out of the sand. All too late.